Our Disability Liaison Officer is Kishan Parmar who can be contacted via The Valley reception or on kishan.parmar@cafc.co.uk. CADSA can be contacted by Email on cadsa@cafc.co.uk and followed on Facebook. All supporters that are entitled to lift passes will be issued with them by the match day stewards at the current lift or entrance used on home match days. 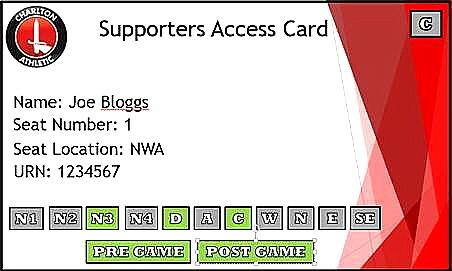 If you are not attending the first games of the season the card will be held at reception during the week and will be available when you next attend a match. If the lift pass is not correct please inform the steward and it will be changed for the next home game. D- Disabled. A- Ambulant. C- Carer is required. W- West Stand. N- North Stand. E –East Stand. SE- This is to use the side entrance in the South West corner. The C in the top right corner will denote a Carers Card. The squares at the bottom are just an example of how it is used and your card will not look the same as the pass shown. N1, N2, N3, N4 will be the lifts that are in use on a match day. The reason that this procedure will be put in place is to assist the stewards with who is allowed to use the lifts and the specific entrances/ exits on a match day. You will be required to present this pass at every home match for access to specific entrances/ lifts to the stadium. Please Note: The only West Stand lift passes being issued to disabled supporters are to access the lounges as no additional disabled season tickets are being sold in this stand. No able-bodied season ticket holders, unless acting as carers, are entitled to lift passes. This is an ongoing procedure and any feedback will be greatly appreciated. Please note a one-way system is in place on match days so please follow stewards' instructions. once the post-game football traffic has dispersed. Live match commentary is available using free audio headsets. A total of 16 headsets are available for collection from the West Stand reception at The Valley, of which 8 can be reserved up to 2 games in advance and 8 are issued on a "first come first served" basis on a matchday. Headsets should be returned to the West Stand reception after the match. As these units are the responsibility of the user any loss or damage may incur a charge. Please call 03330 14 44 44 to have your name added to the list of supporters requesting a reserved headset. Those sitting on the NW, NE, and East disabled balconies should have a member of kiosk staff visiting your seat during the first half, taking your orders for half-time refreshments (excluding alcohol), and these orders should be delivered back to your seat just before the end of the first half. The disabled fans at the front of the West Stand have a trolley service provided at half-time. If any problems with the service occurs during the course of the season please Email us at cadsa@cafc.co.uk and we will pass on your concerns to Delaware North, who are in charge of the catering facilities at The Valley. Capes are available for both home and away match use. If you require the use of a cape at a home match please contact a nearby steward. Any Charlton supporter, whether disabled or not, who wishes to take a rain cape with them to an away match should contact the DLO (Vera Lazalleri) to arrange pick up from main reception. Although there is no charge for the use of the capes there will be a charge of £4.50p for irreparable damage or non return so, for this reason, your contact details will be be taken when arrangements are made for collection. All 10 of the disabled toilets available to supporters on matchdays are fitted with cord-pull alarms and RADAR locks. Disability stewards have keys to these toilets but if you wish to have one of your own they can be bought for £5 (inc postage). Please telephone 0208 305 2221 to order. Now you have no excuse for not joining in. Information regarding the facilities available at all League One clubs for the 2017/18 season can be found here. Details of the ticketing procedure available to Charlton's disabled supporters.